Sometimes, it's nice to eat healthy. Other times, you just want artificial flavoring in your cereal. General Mills (GIS) gets that now. A year and a half after the company removed artificial colors and flavors from its Trix cereal, it's bringing them back. "Classic Trix" -- the bright, rainbow version from your childhood -- will hit shelves in October, the company announced Thursday. 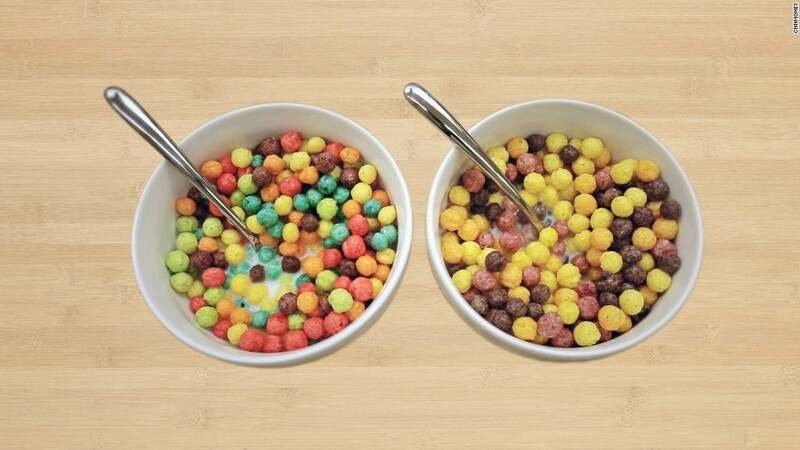 The all-natural Trix -- called "No, No, No" Trix -- will still be available to consumers who want to cut factory-made dyes from their diet. That version gets its more muted coloring from fruit and vegetable juices and spice extracts, like turmeric and annatto, which is derived from the achiote tree. "We're simply listening to consumers and these ingredients are not what people are looking for in their cereal today," Jim Murphy, president of the company's cereal division, said in a statement at the time. The changes to Trix took effect in January, 2016. "Our Trix fans have been calling us, emailing us and reaching out to us on social media asking if we would consider bringing back the original formulation of Trix cereal with its vibrant colors. As a result, we are launching 'Classic Trix' to fill these consumer requests," General Mills spokesman Mike Siemienas said Thursday to explain the change. Siemienas said the company doesn't have any plans to change up the ingredients in its other cereals. Artificial flavoring and coloring has also been removed from Reese's Puffs, Cocoa Puffs, Golden Grahams, Chocolate Cheerios, Frosted Cheerios and Fruity Cheerios since the 2015 announcement. Related: Does anybody eat cereal for breakfast anymore? The problem: Americans just aren't consuming as much cereal for breakfast. General Mills' cereal sales in the U.S. fell 7% from one year ago, the company said. Competitor Kellogg (K) faces similar problems. The company said last month that sales for "morning foods," including Frosted Flakes, Rice Krispies and Pop-Tarts, have also dropped in the past year.